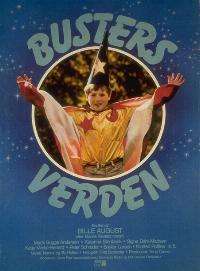 Busters verden (Buster's World) is a Danish children's television series and movie from 1984. Based on a play by Bjarne Reuter, Buster's verden deals with the experiences of young Buster Oregon Mortensen. The television series was a break-through for director Bille August, and the soundtrack also provided a hit for the young singer Nanna Lüders Jensen. The television series was based on a play by Danish author Bjarne Reuter. In 1984 Reuter published his collection Tre skuespil ("Three Plays"); a collection containing also En dag i Hector Hansens liv ("A Day in the Life of Hector Hansen") and Kom der lys i neonrøret, gutter? ("Was There Light in the Neon Tube, Boys?") – in addition to Busters Verden. Director Bille August had already worked with Reuter, on the 1983 movie Zappa where August's script was based on a book by Reuter. August was still a relatively unknown director outside Denmark at the time, but the success he had with Buster helped pave the way for his international break-through with the Oscar-winning Pelle the Conqueror in 1987. The protagonist of the series is Buster Oregon Mortensen, played by Mads Bugge Andersen. Buster's father (Peter Schrøder) is an unemployed magician, from whom Buster learns to perform magic tricks. Buster also has a younger sister called Ingeborg (Katarina Stenbeck), who has a disability referred to as a "stiff leg". Both Buster and his sister are frequently bullied by other kids in school, but he maintains a positive outlook on life, and is confirmed in his optimism when he meets and falls in love with the piano child prodigy Joanna (Signe Dahl Madsen). Episode 1: The school Buster attends is celebrating the 25-year anniversary for the principal. Buster is meant to do a magic trick for entertainment, but ends up spoiling the party. Episode 2: Ingeborg is being bullied by Store-Lars (Big Lars), and Buster interferes for his sister. Episode 3: While distributing milk on his bike, Buster meets the young piano prodigy Joanna, and falls in love. Episode 4: Ingeborg, as a girl scout, is organising a party in the vicar's garden, and Buster helps. Episode 5: Buster is not doing well in school and the teachers believe that magic takes up too much of his time. Episode 6: Johanna invites Buster to perform at her party, but the snobbish guests were expecting Johanna's piano playing, not Buster's magic tricks. The movie was an edited version of the television series, and premiered on 4 October 1984. The content had to be cut down, from the original 120 minutes to one and a half hours. The critics were still happy with the result, however, as many felt the movie format gave the viewer a better opportunity to acquaint themselves with the characters. At the 1984 Berlin International Film Festival, the film won both the C.I.F.E.J. Award (Centre International du Film pour l'Enfance et la Jeuneusse) and the UNICEF Award. The twenty-year-old, and still relatively unknown singer Nanna Lüders Jensen was asked by August to provide a song for the television series. Nanna's song, titled simply "Buster" became an instant hit in Denmark, and launched her to national fame. The song can also be found on her album, "Små Blå Breve"
Actor Mads Bugge Andersen is not happy with this movie and all the attention it gave. He believes in general that there is too little focus on the negative side of being a child star. ↑ Mathias F. Clasen (February 2008). "Bjarne Reuter, Bibliografi" (in Danish). Archived from the original on October 9, 2008. Retrieved 2008-03-05. ↑ "Zappa (1983)". IMDb. Retrieved 2008-03-05. ↑ "Bille August". IMDb. Retrieved 2008-03-05. 1 2 3 4 5 6 7 8 "Busters verden" (in Norwegian). Retrieved 2008-03-05. 1 2 3 "Busters verden" (in Danish). Danish Film Institute. Retrieved 2008-03-05. 1 2 3 Torben Bille. "Nanna" (in Danish). Retrieved 2008-03-05. ↑ "Awards for Busters verden (1984)". IMDb. Retrieved 2008-03-08. ↑ "80s child star from 'Busters World' does not remember fame with joy". Retrieved 2006-03-08. (Danish) Busters verden on the Danish Film Institute's web site. (Norwegian) Busters verden on a Norwegian nostalgia site. "Buster" by Nanna – text and chords.